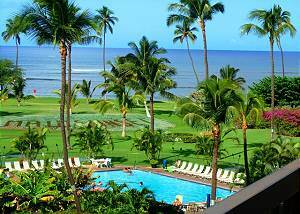 The sprawling Maui Sunset Resort is a beachfront property in Kihei on Maui's South Shore. Pristine, crystal clear waters and sandy beach lie in front of the rental property. As the hotel name would suggest, Maui sunsets are best viewed from the Maui Sunset. From the lawn in front of the resort, you can see the sun streak down the sky in brilliant colors over the West Maui Mountains. The beach fronting the resort is also a perfect place for a sunset stroll. The views from these accommodations are spectacular. During Whale season you can even spot Humpback Whales from many of the condos! Escape to Maui Sunset for a memorable Maui vacation. 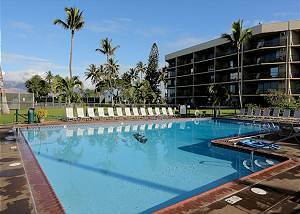 The condominium units at Maui Sunset each have an island style charm about them. 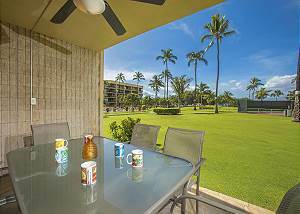 You will feel immersed in the Hawaiian atmosphere at your Kihei vacation rental. The condos are fully-equipped with kitchens, A/C, washer/dryer, and TV/DVD. Each condo also has a private lanai which lends itself to perfect outdoor living in paradise. 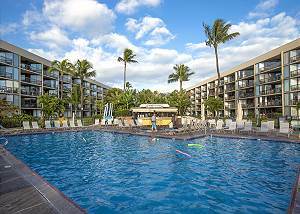 The Maui Sunset Resort is made up of two buildings which shelter and frame a large grassy area. The swimming pool is central to the property and includes a large deck area that hosts pool furniture for you to lay back and enjoy. Two full-size tennis courts are on the hotel property making for some friendly games and competition with friends and family. There are also shuffleboard courts next to the pool if you want to take a break from splashing around. The barbecue areas dotted on the lawn are close to the courts, pool, and shuffleboards, so the family can be playing nearby when you're getting dinner together on the grill. Maui Sunset's location in North Kihei is central to many different attractions and amenities. A 10-minute drive further North will bring you to Maalaea Harbor which hosts a myriad of different ocean activities including an aquarium, the Maui Ocean Center. Many different boat trips launch from Maalaea harbor for destinations like Molokini Crater. At Maui Sunset, you will be close to different dining and shopping opportunities as well as a supermarket for you to stock your Maui Vacation Rental! There are many wonderful places to stay on Maui, but the Maui Sunset Resort sets itself apart, spread out in a quiet beachfront parcel in Kihei. Although you will have a central location, you will feel tucked off of South Kihei Road. Experience tranquility and island style living at Maui Sunset! Choose this beachfront rental now for your next Hawaiian vacation. Life's a walk on the beach at Maui Sunset.